Discover India's mystical and historical legacy, Bhutan's quaint and tranquil charm, Nepal's history on its edifices. 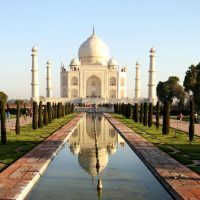 This journey starts with the tour of renowned Golden Triangle: Delhi, Jaipur and Agra, where we visit some of the greatest sights of India, including the Taj Mahal. Fly northeast to Bagdogra and climb up the hills through tea gardens to Darjeeling. Take a joy ride on the famous toy train with astounding views of the Kangchenjunga Himalaya. Travel overland and cross the border into Bhutan, a kingdom of stunning natural beauty with its friendly, colorfully dressed people. Spend a week in Bhutan visiting ancient monasteries, villages, farms and meeting with locals. A breathtaking flight over mountain vistas brings you to Medieval Kathmandu. In Kathmandu, admire magnificent royal residences, cobbled streets, ancient squares and buildings sprinkled with intricately hand-carved windows set against a backdrop of the majestic Himalaya. In the narrow lanes and alleys, jostle with Nepalese people in a happy and lively atmosphere. Visit artists markets, temples, pagodas, a hill resort and a local home. Meet upon arrival and transfer to a hotel. Overnight hotel. Drive to Agra visiting Sikandra tomb en-route. 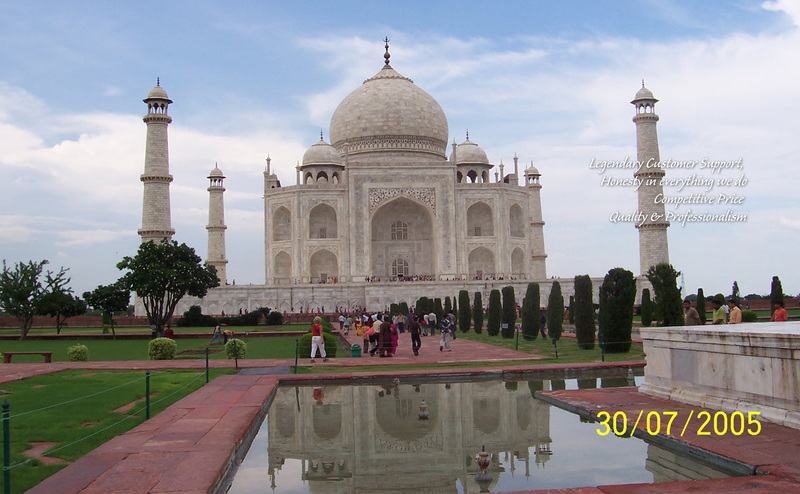 Upon arrival in Agra, visit Agra Fort and Taj Mahal at the sunset. En-route to Jaipur, visit the ancient Mughal capital of Fatehpur Sikri. Evening in Jaipur is for stroll and walk into the old city.Overnight in hotel. Start with the visit of Amer fort at the outskirts of Jaipur. 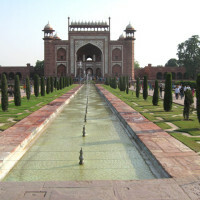 Later visit City Palace, Jantar Mantar Observatory followed by Hawa Mahal and the walk through the colorful bazaars. Overnight in hotel. Drive back to Delhi and pursue your own interests in the evening.Overnight in City Park. Transfer to the airport and fly to Bagdogra airport. Upon arrival, meet and drive for about 3-4 hours to Gangtok, the capital of Sikkim, once an independent country. In the evening, stroll around MG Marg, a promende or Avenue, where vehicles are not allowed. Overnight in hotel. 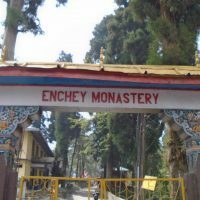 Full day tour of Gangtok, Sikkim, where we visit Enchey Gompa, Tashi viewpoint, Flower Expo, Tsuk Lhakhang temple inside the former Palace complex, cottage industry, Institue of Tibetlogy, Dodrul Monastery and local farmer’s market. Overnight in hotel. Descend from the hills to the plains and cross Duars area with Tea Gardens of west Bengal into Phuntsholing at the foothills of Bhutan. 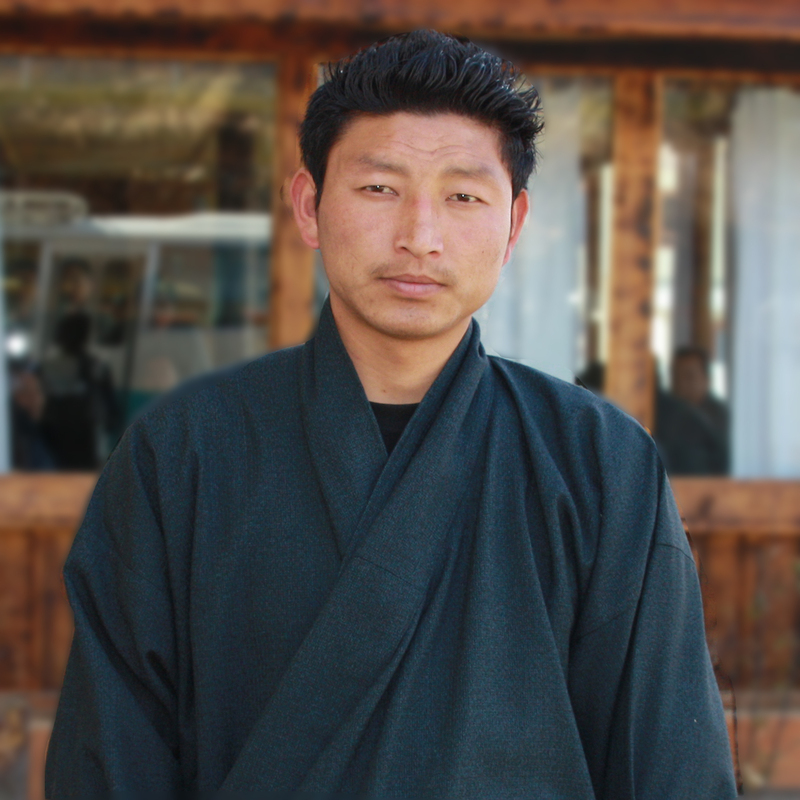 Meet our Bhutanese Guide and stroll around the town. Overnight in hotel Druk or best available. Drive uphill to Thimphu after completing immigration formalities. En-route make a stop and visit Rinchending Monastery, other villages and towns along the way. 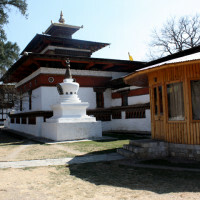 Once in Thimphu, visit Tashicho Dzong and tour around town. We have a full day in the capital to cover all the major landmarks and interesting attractions. Overnight in hotel. After further sightseeing of Thimphu in the morning, then drive across Dochula Pass to Wangdiphodrang. 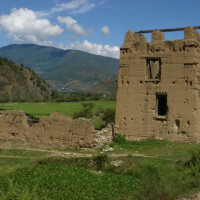 Visit the town and fortress in Wangdue. Spend the night near Punakha. Overnight in hotel. In the morning drive and walk to Khamsum Chorten and visit local homes. Later visit Punakha Dzong and Chimi lhakhang temple. In the evening stroll around the new township of Punakha. Overnight in hotel. Drive back to Paro via Thimphu. At Paro, visit National Museum and Rinphung Dzong. Overnight in hotel. 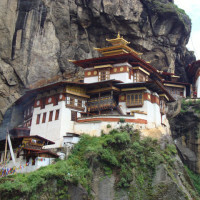 Hike to Taktsang (optional) and visit ruins of Drugyal Dzong, Kichu temple and a typical farm house.Overnight in hotel. Upon arrival, meet Nepalese Guide and drive to Bhaktapur city to visit Durbur Squares and temples. Continue to drive toward famous Nagarkot hill resort for panoramic views of the Himalayas. Overnight in one of the Hill Resorts. Drive back to Kathmandu. Visit Syambhunath and Kathmandu Durbur Square. Have dinner with a live entertainment at a local restaurant. Overnight in hotel. Visit Boudanath, Pashupatinath temple in the morning. Later visit Patan city.Overnight in hotel. Transfer to the airport in time for a flight to your next destination. 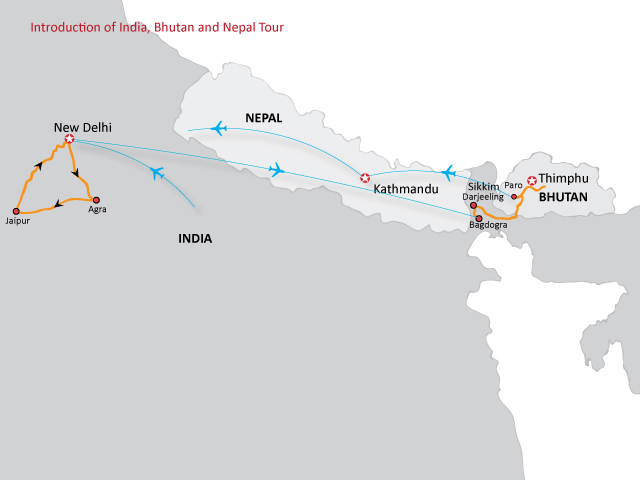 You can fly back to Delhi, Varanasi, Bangkok from Kathmandu. MealsBreakfast & Dinner in India & Nepal. All meals including evening tea in Bhutan. 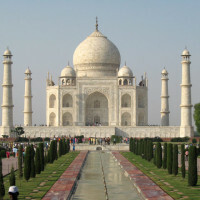 Trip AccommodationIn Delhi, Agra & Jaipur, among many, you may choose hotel as per your liking. Cost will reflect accordingly. In other places we try to use best in the area. In Bhutan hotel are tourist standard and in places where avail, we use upgraded accommodations. For instance, 4* Hotel Druk & Tashi Namgay Resort in Thimphu and Paro respectively. Note, recommended hotels are based on amenities, ambience and location. 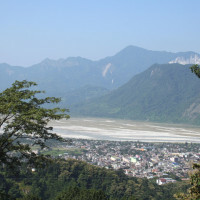 RouteAgra, Jaipur, Delhi, Bagdogra, Darjeeling, Phuntsholing, Thimphu, Punakha, Paro, Nagarkot, Kathmandu. Starting USD$ 3500 and it varies based on number of participants and travel dates. Breakfast and Dinner in India and Nepal, and all meals including evening Tea in Bhutan. All private land transfers and transportation by good quality vehicle. India Visa and Nepal Visa. Nepal visa is free upon arrival for the duration of this tour. In Delhi, Agra & Jaipur, among many, you may choose hotel as per your liking. Cost will reflect accordingly. In other places we try to use best in the area. 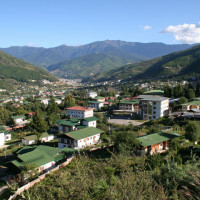 In Bhutan hotel are tourist standard and in places where avail, we use upgraded accommodations. For instance, 4* Hotel Druk & Tashi Namgay Resort in Thimphu and Paro respectively. Note, recommended hotels are based on amenities, ambience and location. 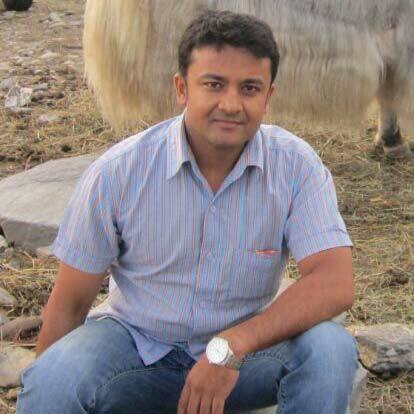 Min Bahadur Singh was born in 1977 in Bajura district, far western development region of Nepal and later on he moved to Pokhara, permanent resident of Kristi-3 Kaski, Pokhara. 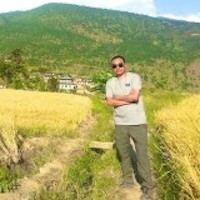 He is Trek and City Tour Guide in Pokhara city, Nepal, a city of natural beauty and on the lap of the Himalayas. He has completed his intermediate education level and various training related to the travel and tourism industry. He started his career in the hospitality industry since 1992. 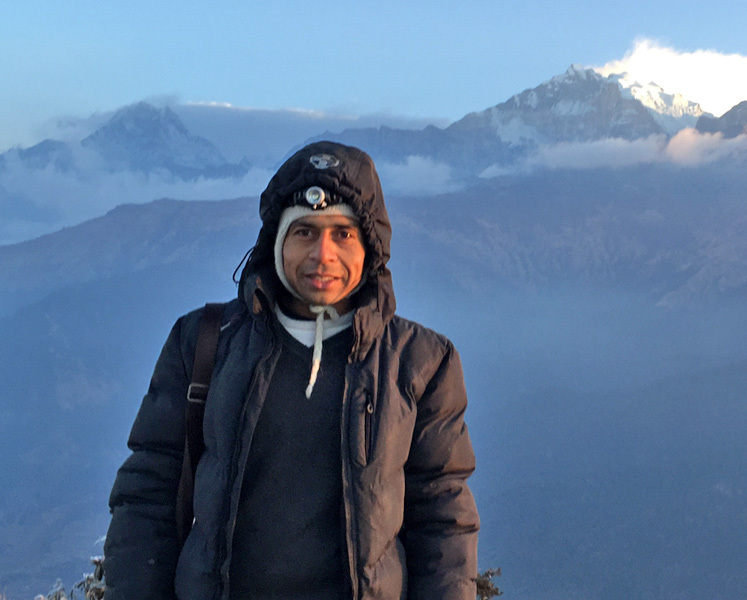 He’s worked in the tourism sector for 24 years and has 12 years of guiding experience involving in different travel and trekking agencies in Nepal. 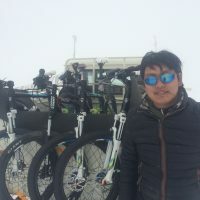 Min has joined to this company since 2014, and he does city tour guide in Pokhara and Annapurna region Trekking as well.On top of that, he is also bird watching specialised in the mountain region of Nepal. 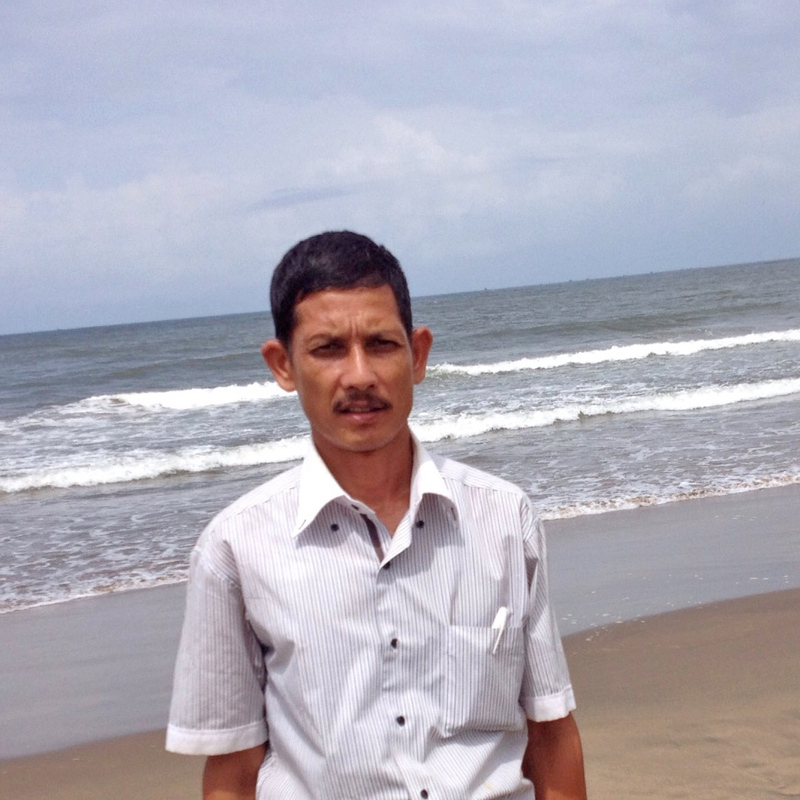 Min speaks English very well and has been the beloved guide for English speaking tourist. He loves to travel, meet new people and share his ideas and experiences to other people. Dear Mr Kinga Dechen and Mr Rinzin Jamtsho, Bhutan is amazing. We were so far removed from our reality while we were there that I couldn't stop being excited for one minute of my stay. I have never been in such a nationally reverent and devout country, and am so grateful that I got to experience it. On top of that, we had the most wonderful guide (Nim Drugyel) who made our trip really interesting and fun. The sites we visited became even more significant because of his knowledge and his obvious passion for the places we visited. And he also told captivating stories related to the sites we saw in a very, very charming way. He showed a great deal of concern for us, was comfortable to be around, was personable, polite and fun. We don't know what we would've done without him. We also had a wonderful driver, Wangdi, who never failed to get to the car door before we did, so that we wouldn't have to open it for ourselves!!! (We're not used to being waited on here at home- it was wonderful!) My husband and I will be going on Trip Advisor and some of the other travel sites to review our wonderful trip. Thank you for all the arrangements that were made to show us the amazing things we found in your country. I believe we'll be back!!! 8360 Greensboro Drive #1012, McLean, VA 22102 November 2012. Over the Thanksgiving holiday in 2012, my wife and I packed in a Nepal/Bhutan trip where we maximized our time to experience both countries. After contacting a number of travel agencies, we settled on Wind Horse (www.windhorsetours.com) based on testimonials and price. We were not disappointed. Everything that we wanted to do, given the limited time, was accomplished. This included photographing Mount Everest from the air, climbing Tiger’s Nest in Bhutan, and spending time at Chitwan National Park in Nepal. Although we didn’t see a tiger (did not expect to do so), we did see white rhinos. Guides spoke English very well and were always prompt, courteous and accommodating. Drivers especially well skilled. Everything went off as planned and the tour guides were especially flexible to ensure we did everything that we wanted. We highly recommend them for travel in that area of the world. 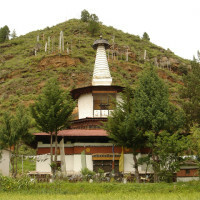 Petrie's India,Nepal & Bhutan Private Tour. TID -753 (Sep 13 - Oct 03, 2014) Dear Anand and team, Namaste! Thank you for your follow up message! My apologies for the delay in response. It would be my pleasure to provide feedback and any endorsements that would be useful to you in future planning and for promotional purposes in bringing on new guests. This trip was truly remarkable, and my mother-in-law and I had the experience of a lifetime. It is with reluctance that we are making our transition back into life now in the US again, because we enjoyed our time abroad so very much, and because we still dearly miss the people, and the sights, sounds and tastes of these amazing countries! 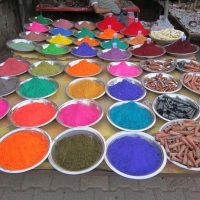 The India portion of the trip was our favorite time, and we learned so very much. We were particularly impressed with Gaurav Goyal as our guide, as you know, and couldn't recommend him enough. He made us feel like family during our stay and went out of his way to ensure that my mother-in-law in particular felt comfortable and cared for. Unfortunately, she had developed an issue with her back during the trip that she is still recovering from, which has been making walking all the more difficult for her. This, regrettably, was the reason for cutting the time in Bhutan short. I had very much been looking forward to hiking those last couple of days, but just did not feel good about leaving her behind in the hotel in order to do that. Back in Delhi, we were able to take in a few more activities that she and I could enjoy together. But not only Gaurav - all of the guides, and the drivers as well - went above and beyond to assist her every opportunity that they could, in every area we visited. Thank you so very much for all the kindness and thoughtfulness! Our hotels were all very nice facilities, and we found ourselves continually pleased with the arrangements. Our favorite places to stay were the The Hans in Delhi, the properties in Jaipur and Agra, and Club Himalaya Nagarkot. Again, thank you! We have so many pictures and video from our travels! I put together a YouTube video - which you are most welcome to view and/or share, if you would like - of just one day of sightseeing in Delhi, and I am actively in the process of making more, one from each segment of our trip: http://youtu.be/rI0U8HejXk8 As soon as I get the opportunity, I do also plan to add some comments to TripAdvisor about your company and the various places we saw and where we stayed. In the meanwhile, if you have any further questions for me, or if there is anything else I might do for you, please don't hesitate to let me know. 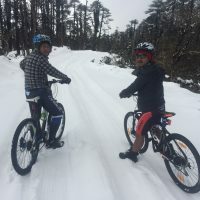 Dear Anand, I have nothing but the highest praise for Windhorse; the recent tour I did of Bhutan and Nepal were first-rate and, in my opinion, could not have been better. Regarding Bhutan, Sonam, my guide was just the best. Informative, helpful, solicitous, friendly incredibly good at getting me "into" the inside of what makes Bhutan tick, Sonam was everything you could possibly want a guide to be. He made the whole trip so much fun. Sonam our driver was, in exactly the same way, also everything you could possibly want. Abel to negotiate the twistiest Road, I never felt once that Sonam did not know exactly what he was doing and I felt complete confidence in his ability to get us where we needed to go. Pem (spelling?) in Nepal was equally terrific, informative, helpful, and courteous; I can't say enough good things about him. I short, I had a terrific time, and if I hadn't caught a horrible bug on the Jet Airways flight home (which I'm only just getting over now), I would have been in touch earlier. I will post all these views on Trip Advisor, you can be sure. Many thanks for a wonderful experience, which I am still processing. Gaya, Bhutan and Nepal Tour 25 Oct -12 Nov, 2009 Hi, Ugen, We just wanted to thank you for the wonderful trip we had in Bhutan. Sonam and Sherab were excellent. The service and rooms at the Uma resort were the best we have ever been in anywhere in the world. There were places Mimi had not seen on her first trip; she is thankful to have gone back to Bhutan to see these places and hike more on this trip than her last one. We would like to have Sonam's email to send some pictures to him if you have it. We also heard through Sonam that you were helping with a documentary about Eastern Bhutan. Let us know if it comes out on DVD or TV so that we may see another part of Bhutan that we'd like to visit one day. All the best to you. Mimi and Brad. TID 153: Introduction of India, Bhutan and Nepal (Sept 30- Oct 20, 2008) Ugen- Our trip was wonderful. I want to commend you especially for the guides in India (Delhi), Nepal and Bhutan. The insight that each one gave to us on the culture and the country was very personal and very rich. The drivers were all especially good. What roads! Excitement all the time! Just a couple of recommendations: There is a photo required for Bhutan entry, and only 1 for Nepal. That created some confusion. Also, in Nepal, every time we went in and out of airports there was a tax. This should receive a general mention in the trip guidelines. All in all, I loved the whole experience and I would definitely recommend Windhorse Tours to anyone. I have been telling my friends about the trip, but until I get my pictures organized, they will have a hard time understanding. Plus, as you know, unless a person has experienced such travel directly, it is hard to communicate the benefits. Thanks again. The hotel in Thimpu was a disappointment, but I know it was hard to book because of the festival. I was guessing that when we added Joanne to our group that there was a change needed in hotels. TID 153/187: India, Bhutan & Nepal (Oct 5-20, 2008) I got back yesterday morning. The trip to Bhutan was fantastic. It is quite different from anywhere else that I have ever been and was well worth the money. Everything in Bhutan ran very smoothly and I would particularly like to mention both Tashi the guide and Dorje the driver, who were both excellent. 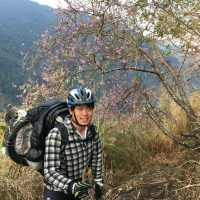 At one point, I lost the key to my suitcase and by ringing around, Tashi managed to locate it at the place where we had stopped for morning tea and the next day, it arrived via one of the other guides. It is hard to think of anywhere else in the world where such excellent service would operate. The standard of the hotels was far better than I expected (better than Nepal) and the food, though a bit repetitive, was plentiful and quite adequate. Everything that we saw was quite magnificent and would love to be able to see more of the country sometime. - Nepalese money cannot be spent in Delhi airport, so anyone with a long layover should keep some Indian rupees for buying food etc. at the airport. - You did mention that 500 rupee and above notes cannot be used in Bhutan. I had read this but not knowing the exchange rate, assumed that this applied to large amounts of money, not the equivalent of around 13 euros. In fact, i had no difficulty using 500 notes in Bhutan but it's another story in Nepal, where one of our group nearly had a serious problem with customs. My own experience in Nagakot was not too good. The hotel was fairly full and I was put up in a room that is normally used by the guides. The walls had large damp patches and the towels, though clean, looked as if they had been in continuous use for more than 10 years. It was more like Youth Hostel accommodation than a hotel. In general, this would not matter too much but it was not what I paid for. The restaurant was also poor. I declined the buffet as this kind of food is normally very bland for my taste and I am not a big eater. However, what I ordered off the "a la carte" menu turned out to be buffet food anyway, as I got the same as people sitting on the next table! My guide, Chan was very accommodating and the next day he took me to an excellent local restaurant in Kathmandu. Finally, as you probably know there were some problems with the accommodation in Kathmandu. Although I was not personally affected, I would like to point out that our guide and Dave did there very best to resolve the situation. Regards, Joanne ------- Windhorse response: With regards to the photos for visa: When entering Bhutan from Phuntsholing, some of the immigration officials will demand passport size photo but not when arriving by flight into Bhutan. Nepal visa require one and sometimes 2 photos. 5 " " TID 153:Introduction of India, Bhutan and Nepal (Sep30 till 20 Oct, 2008) What a wonderful trip! Everything was so well coordinated by Windhorse! The guides and drivers were great. 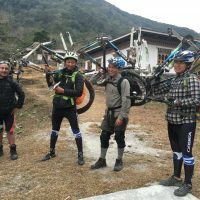 We were unhappy with Hotel Manaslu, but our guide and the Windhorse representative, Dave, did a great job of addressing our concerns. TID 153:Introduction of India, Bhutan and Nepal (Sep30 till 20 Oct, 2008) What a wonderful trip! Everything was so well coordinated by Windhorse! The guides and drivers were great. 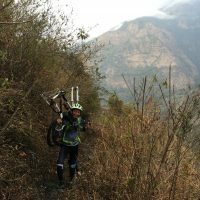 We were unhappy with Hotel Manaslu, but our guide and the Windhorse representative, Dave, did a great job of addressing our concerns. Thank you so much for everything. 1) Were you provided adequate information about your trip prior to coming here ? 02.Were you met at the point of arrival with the maximum efficiency and courtesy? 03. Did the tour get off to a good start? 04. Did your guide fulfill your itinerary? Yes, an excellent guide. Went out of his way to be helpful considering he was ill with flu. He was also excellent sorting our problem with visas & photos. Helping find lost cameras & broken cameras. Tashi is an extremely helpful person. The guide led my horse all the way up the hill to the Tigers’ lairs because I was so nervous, then continued running back down the mountain to check the walkers. Very good service. 05.Was the itinerary confusing with unnecessary details? 06. Was the service of your tour guide and driver upto the mark? Yes, excellent guide backed up by a very helpful, friendly & excellent driver. A wonderful team. 07.Has there been any occasion where your guide and driver were not punctual? No! always more helpful than we expected and always punctual. 08. Please comment on the food, accommodation and the services rendered by the hotels/trekking crew. Food adequate, all hotels staff have been very friendly and helpful. Mini bus was comfortable. 09. Is this your first visit to Bhutan and do you wish to come back again? 10.On the whole, how do you rate your trip? 11. How would you like us to improve our services? Hotels in Bhutan should improve their quality of mattresses. Also maintenances eg. Light bulbs, showers that flood the floor, toilets that do not work. 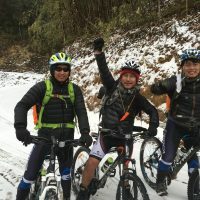 Greetings Ugen, Postak (WindHorse Minnesota), Santosh (WindHorse India), and Chimi (WindHorse Bhutan)! I want to thank all of you for all your efforts in arranging a most spectacular trip to India, Nepal, and Bhutan for me and my travel buddy, Mary-Anna! Ugen and Postak did an excellent job in managing all of our initial plans and arrangements – keeping us well informed and up to date with all the various options and connections for our 5-week journey (March-April 2008). 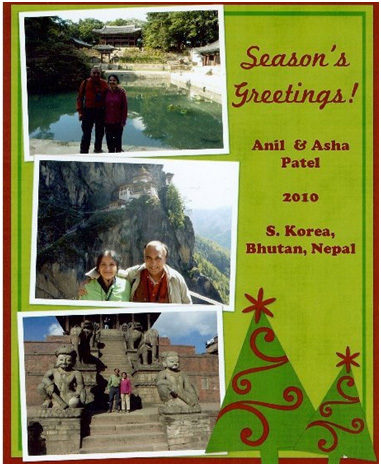 They helped us build a trip itinerary that allowed us both structured and independent travel even through times of political challenges in Tibet and Nepal. They quickly mobilized to get us on track when our Tibet tour had to be cancelled. 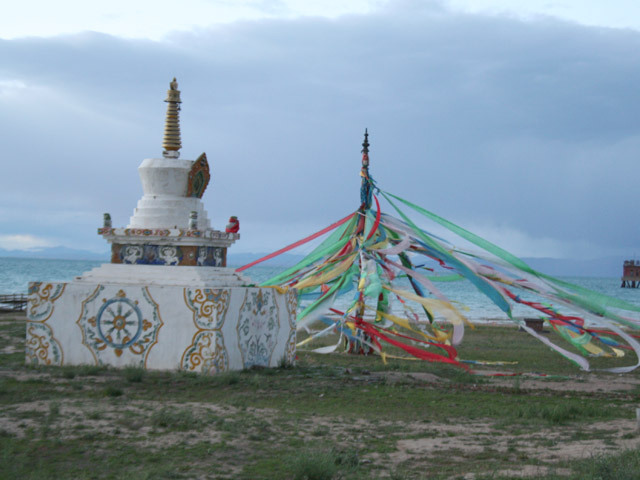 Within days of our planned departure (due to the conflicts in Lhasa) we shifted our plans to visit India instead. 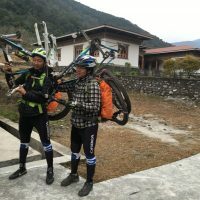 Weeks later, while in Nepal, they provided us a WindHorse contact to help us maneuver through the challenges of departing Kathmandu for Paro, Bhutan in the middle of the first Nepalese national election (when all transportation was shut down). All our communications with them by phone and email were professional, courteous, informative, and prompt! We really appreciated the personal attention! The WindHorse network is extensive and reliable! We worked with their partners and associates in each country. The Minnesota team put us in contact with Santosh in India who personally escorted us to the New Delhi train station at 5 in the morning for our trip to Agra (what service!!). Santosh arranged the connections and our fabulous guide in Agra, Ram Naresh Mittal. 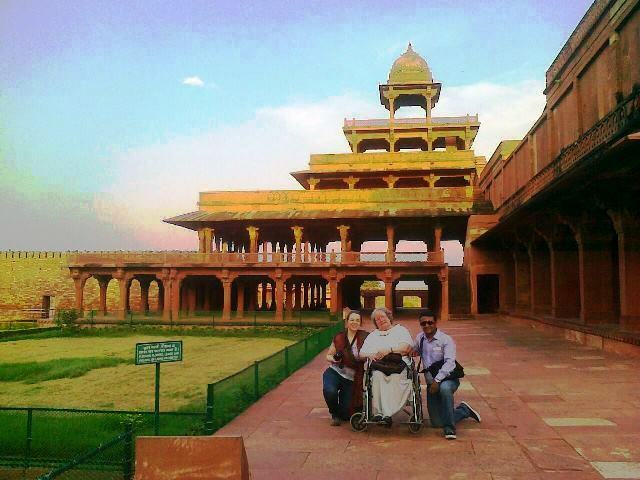 Ram delighted us with the history and lore of the Taj Mahal and the Agra Fort. 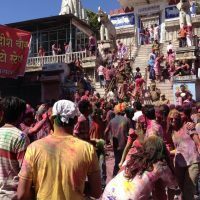 And through the WindHorse Agra network we were able to customize our journey through Rajasthan and onward to Nepal. I also want to commend our guide “PJ” at Fatehpur Sikri in the Agra district – his enthusiasm for and love of this wonderful “ghost palace” was infectious and he greatly enhanced our knowledge of the Mughal Emperor Akba that started with Ram at the Taj Mahal. As much as we loved India and Nepal… the people, the colors, the mysticism, the Himalayas, the intensity… Bhutan presented us with its own unique reality that we fell in love with. Our two weeks crossing west to east were truly spectacular. Windhorse provided the most excellent guide, Sonam Gyembo and the very careful, conscientious drivers, Passang Tshering and Nidup Tshering. We cruised in the comfort of Nidup’s SUV, as day by day we headed eastward. Sonam used each day to build our knowledge and understanding of Bhutan’s history, culture, politics, and the influence of Buddhism. Sonam was the most attentive guide and truly inspirational. Together with either Passang or Nidup they made sure we had every opportunity to enjoy our trip and make it our own. 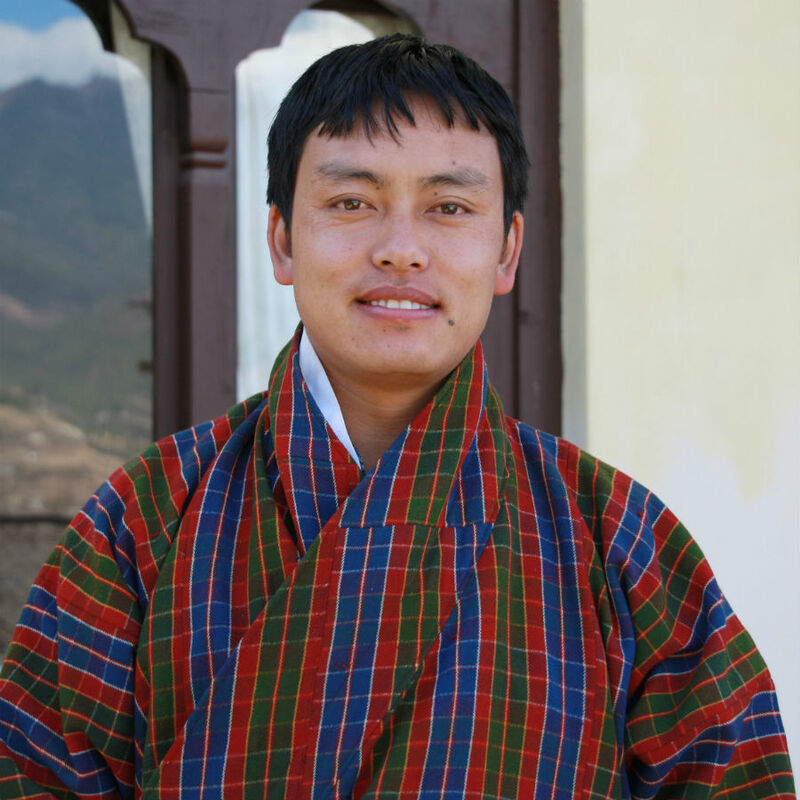 We found a love for the birds of Bhutan – so Sonam found us a field book and even he became a talented bird spotter. We wanted to learn to eat the Bhutanese dishes in the traditional manner – so Sonam and Passang showed us how to eat with our fingers and were tolerant as we made messes and teared up eating the chilis. 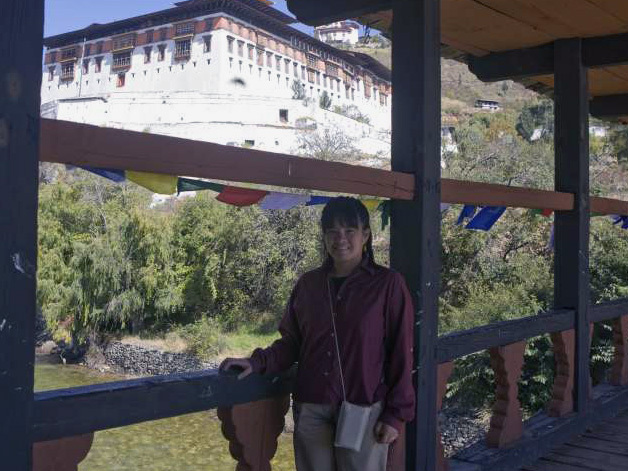 We wanted to visit a hospital in Trashingang – so Sonam made that happen and we learned so much about health care in Bhutan. We wanted to learn to pay homage in the temples – so Sonam taught us the proper prayers, salutations, and prostrations. 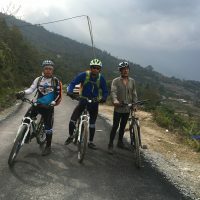 We wanted to take a bike ride – so Sonam found bikes for us to rent in the Phobjikha Valley and Nidup rode my bike back when I got pooped! We wanted to visit a traditional home – so Sonam made that happen in a most gracious manner. We never tired of the mountains; the winding roads, the Dzongs, the temples, and we increased our appreciation for the people of Bhutan each day. Well, as you can see, I can go on and on in my praise for the WindHorse team and your network of fabulous guides and drivers. I came home with lasting and oh so vivid memories of this fabulous trip. I have been so pleased with WindHorse that I will continue to recommend the company to my friends and associates. And, of course, I hope to travel again someday with WindHorse. Namaste and Kuden Che! I want to thank you for your service, you did a great job planning the trip and taking care of the problems that arose. Postak, I met your nephew in Nepal, he did an excellent job. Our guide and driver in Bhutan were awesome, too. I want to thank you for your service, you did a geat job planning the trip and taking care of the problems that arose. I appreciate your help. In India (December 1997) ontmoeten we Ugen voor de eerste keer. 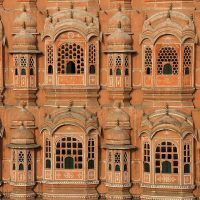 Hij werkt voor een Nederlandse tour operator en organiseert onze Rajasthan-rondreis. In 1998 de oprichting van het reisbureau “Plan holidays” in Kathmandu (Nepal) door Ugen samen met zijn beste vrienden. In het zelfde jaar regelen ze onze Nepal-rondreis op een perfecte manier. Ondertussen wordt in Bhutan het licht op groen gezet voor tour operators en start Ugen “Wind Horse Tours, Treks & Expeditons” op. In 1999 vertrekken we naar Bhutan o.l.v. “Wind Horse”. Ter plaatse worden we door een zeer professioneel team omringd. Vooral de flexibiliteit waarmee het programma steeds aan onze wensen wordt aangepast, maken deze reis onvergetelijk. Wij danken het “Wind Horse” team voor hun enthousiaste inzet en medewerking. Bhutan en “Wind Horse” vormen een ideale combinatie om dit uniek en fascinerend land te ontdekken ... kortom een aanrader van formaat! Wat ons betreft, nieuwe afspraak in 2001 met Ugen en zijn team ... zin om langs te komen?